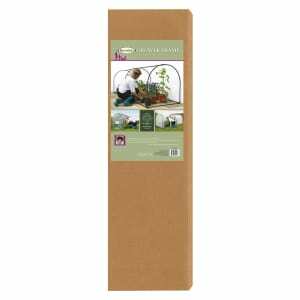 Whether you are growing from seed, cuttings or plugs we aim to give your plants the best possible chance at all stages of propagation. 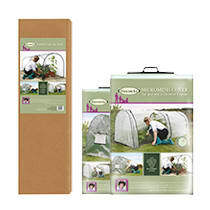 From germination to planting out, in a seed tray, propagator or green house our extensive range of Rootrainers, garden cloches and plant protection fabrics will help to ensure healthy growth and a happy harvest. 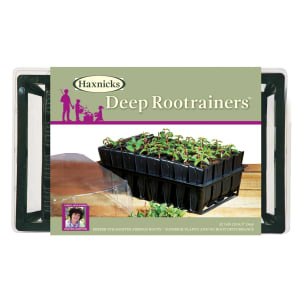 Deep Rootrainers are the workhorse of the range - suitable for propagating and cultivating nearly all plants, trees, shrubs, herbaceous, fruit and vegetables; especially those that have deep fast growing roots such as sweet peas and beans. 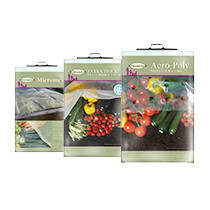 Cell depth 12cm (5") Tray Size Length 36cm (15") Width 22cm (9") Depth 9cm (3.5"). 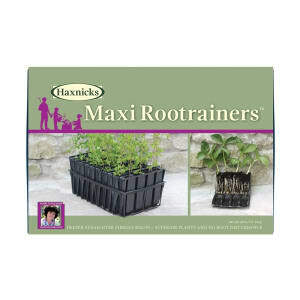 The Maxi Rootrainers™ are the largest modular Rootrainer in the range, perfect for broadleaved trees grown on a long cycle to larger salable sizes and for plants destined for dry sites. Please Note: Rigid trays are an essential part of the system. 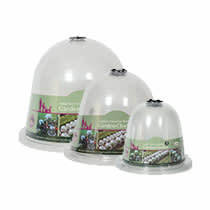 Propagating lids are not available for the Maxi. 40 cells/tray (10 books), Dimensions 44.5cm x 27.5cm x 13cm, Volume 350cc. 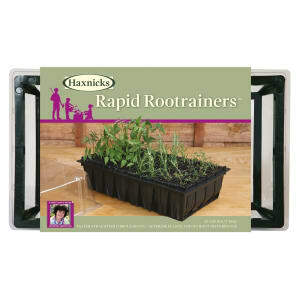 The Rapid Rootrainer is perfect for all bedding and container plants, salads and herbs. Cell depth 8cm (3") Tray Size Length 36cm (14") Width 22cm (9") Depth 9cm (3.5"). All the best things come in small sizes! Compact Rapid Rootrainers are a designed for smaller scale growing with all the features of original Rootrainers in a more compact module. 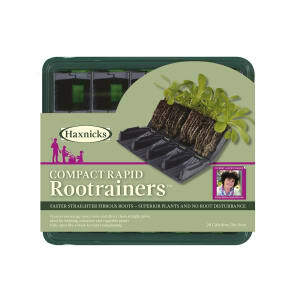 Cell depth 8cm (3") Tray Size Length 24cm (9.4") Width 22cm (9") Depth 9cm (3.5"). 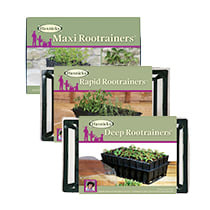 This handy racking system, designed especially for Rootrainers, will save on space, make tending to plants easier, and enhance the air- pruning properties of your Rootrainers. 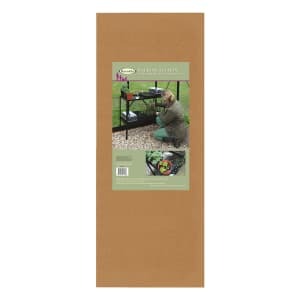 Depth 39cm (15") Height 78cm (2ft9") Width 87cm (2ft10") . 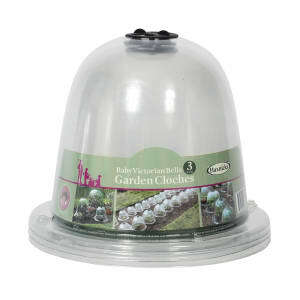 Baby Victorian Bells are perfect for protecting seedlings, and tender and semi-hardy plants.. Length 15cm (6") Height 20cm (8") Diameter 25cm (10") . 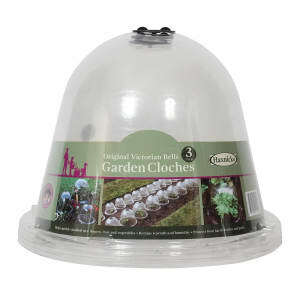 Original Bells are ideal for warming soil, planting out and encouraging stable, healthy growth of seedlings and tender plants. Length 15cm (6") Height 26cm (10") Diameter 34cm (13") . 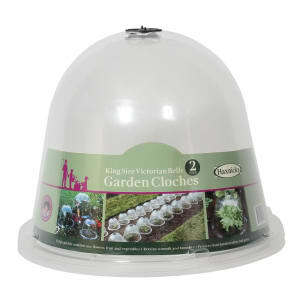 King Size Victorian Bell cloches are the next size up from the best selling Original bells and are ideal for our 45cm diameter vegetable planters. Length 15cm (6") Height 31cm (1ft) Diameter 40cm (1ft3") . Width 1m(3ft3") Height 1m (3ft3") Length 3m (9ft10"). 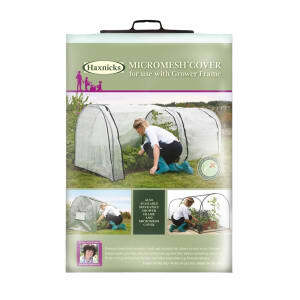 The Grower Pest Protection Cover is made from Haxnicks award-winning Micromesh™ for protection from insects, including aphids, carrot fly, cabbage root fly and other airborne pests.